Almost 720 days have passed since the 2006 FIBA World Championships, today, the United States gets their shot at redemption. For Vasileios Spanoulis (NO idea how to pronounce that) and the Greeks that sent the U.S. home without a championship, were not in Japan and this isn't the same team you played on September 1st, 2006. On that day, the national team from Greece completed an international upset that clearly sent shock waves to U.S. Basketball and everyone involved. Introducing, the NEW Chris Paul. Replacing the Chris Paul of September 2006, is the Chris Paul of 2008. Coming a off an NBA season in which the former Wake Forest point guard averaged 21 points and nearly 12 assists a game. Paul has replaced the likes of Steve Nash (2-time league MVP) as the games top floor general in 2008. After improving his career assists per game average by more than an assist a game in 2008, Paul returns back to the national stage aware of his past performance and hungry to erase that memory. Gone is the man who you saw go 0 for 5 in 24 minutes against the Greeks back in 2006. Don't know Michael Redd? He may not be a household name in the United States, playing in NBA hell (Milwaukee, Wisconsin) will do that to a man, but he's more than worthy of wearing the red, white, and blue in Beijing. Michael Redd has hit over 110 three-pointers playing for the Milwaukee Bucks each of the last two seasons, and for a team that shot a dismal nine for twenty-eight from behind the international arc against the Greeks, he'll be a welcomed addition. While stars Carmelo Anthony and Lebron James can take the ball to the rack, their 3 for 12 effort that day leaves something to be desired. Redd provides a better 3-point option for the U.S. team, an option their 2006 version didn't have. No disrespect to Joe Johnson and Kirk Hinrich, but there is a duo from Utah that provides a stronger more physical dimension to the U.S. Olympic team. 6-3 All-Star guard Deron Williams and fellow Jazz teammate, the 6-9 260 pound forward, Carlos Boozer, give the U.S. team more physical depth. A Greek team that puts out 6 players 6-9 or taller will need to be defended by players who can play bigger than they are, players like Boozer and Williams. Williams strong play at the guard spot will give fellow guards Jason Kidd and Chris Paul the ability to rest without the U.S. team missing a step. The veteran Kidd, Chris Paul, and Deron Williams, control a back court that the U.S. team needed with strong wing players and guards, Carmelo Anthony, Lebron James, and Dwayne Wade being able to move without the ball so well. For what the U.S. team lacks in height, they make up for in KOBE! Out are the likes of Antawn Jamison, Shane Battier, and Elton Brand, in is the GREATEST PLAYER ON THE PLANET. Yes, Kobe Bryant is the greatest player on the planet, and can probably talk trash in more than one language. Not only is Kobe one of three players on the Olympic team with championship experience, but he's the only player on this roster who was still playing for a shot at an NBA title come late June 2008. Kobe has had two lackluster games thus far in Beijing and anyone who has watched Bean play over the last decade, knows Kobe is due. The greatest pure talent this country has seen since Michael Jordan, Kobe Bryant provides a completely new dimension to this team. A top defender, scorer, and passer, Bryant could anchor this team to a gold medal, another trophy to add to his littered mantle. You know 2006 FIBA World Championships lead scorer, Carmelo Anthony, is back and you know that Lebron James is also joining him. Unfortunately for the world, so is Dwayne Wade, a healthy Dwayne Wade. The last time the world saw Wade he was coming off one of the most impressive finals run the NBA had ever seen, with his Heat out of contention since the second month in the season, Wade has had plenty of rest, and it's shown. 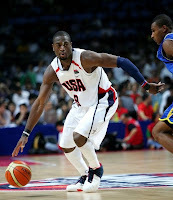 Wade has scored 19 points in each of the first two games and gone a combined 13 for 15 from the floor since arriving in THE PEOPLES REPUBLIC OF CHINA (sounds inviting, yet scary, that's accurate) With the U.S> team primed and ready to play Greece, it's Dwayne Wade who has been most impressive. You have been a HUGE blemish on the history of U.S. Basketball, but Greece, you may have woken up a monster and lucky for you these Olympics aren't in Athens.